We love our food in Northern Ireland, and that means we have some food brands we hold very close to our hearts! From simple pleasures courtesy of local bakeries to soft drinks for those with a sweet tooth, there are some names you’ll find in many a local shopping basket. We’ve a debated between ourselves and – trying to look beyond the obvious products – pulled together some truly iconic NI brands. Visiting Belfast? It’s safe to say you are surrounded by tea addicts. A ‘cuppa’ is a corner stone of many family homes and meals. So, what could be better than a Belfast brew we can call our own? 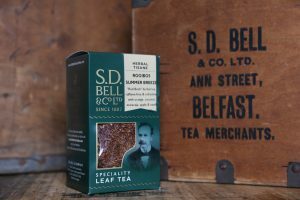 You’ll find tea by SD Bells on discerning shop shelves AND they boast a traditional tea-room in East Belfast too. Tea connoisseurs should also seek out the superb Suki brand tea (it also makes a great souvenir) and the ever-popular Punjana by Thompson’s. Tourists might be amazed by how many meals in Belfast come with some form of potato – be it baked spuds, chips or even crisps – but we bet some form of bread won’t be far from the table either. From simple bread and butter to a crunchy, filled Belfast bap we’re big consumers of the baker’s art here. Special mention goes to the famous NI Veda loaf, a dark and malty bread much enjoyed by local people. Many people also find a piece of Wheaten bread – another local favourite – with butter is delicious with soup or stew. Look carefully and you might stumble on some bottles of Maine soft drinks. Those wee plastic (or better still, if you can find them, glass bottles) have quite a back story. Famous for being delivered door-to-door for over 65 years, a huge range of sugary drinks includes some Northern Ireland favourites such as Brown Lemonade. And Football Special has a tale all of its town: the unique soft drink is famously associated with County Donegal but now – like the rest of the Maine range – is made in Ballymoney, County Antrim.